Click here for a printable version of our fundraising opportunity information. The secret to a successful fundraising project is to sell quality products at reasonable prices; Hermann Wurst Haus is here to assist in your school or non-profit organization with that task. Hermann Wurst Haus has created two unique ways for your school or organization to raise money, the Snack Stick and Sausage Fundraiser and the Brat Cart Fundraiser. Both fundraising opportunities utilize Hermann Wurst Haus’s award-winning products offered to you at our wholesale prices. 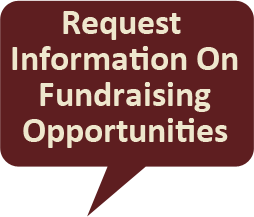 For more information about fundraising opportunities or to schedule your fundraiser please call 573.486.2266. Award-winning, shelf-stable snack sticks and sausages are available for fundraising as well as Hermann Wurst Haus gift cards. We encourage scheduling fundraising projects 1-2 weeks in advance. Hermann Wurst Haus will provide the organization with order forms and promotional materials. We offer free delivery to schools or organizations within 30 miles from Hermann, Missouri. Organization will be billed at wholesale prices. Hermann Wurst Haus $25 gift cards are sold to the organization at a discounted rate. Pre-sales are encouraged for 2-3 weeks. Orders will be filled within 4 weeks after the order is received. Payment is due 15 days after order is delivered. 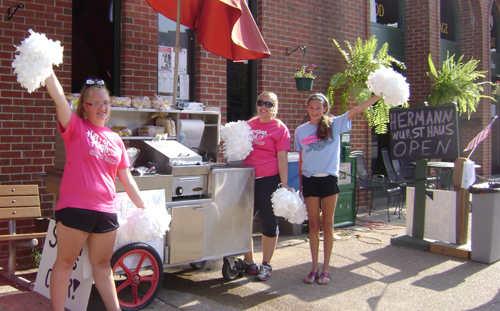 We encourage scheduling the Brat Cart Fundraiser 3-4 weeks in advance (FYI – Octoberfest dates fill quickly). Organization will be billed at wholesale prices for the bratwurst and hot dogs used, other items will be billed at the Hermann Wurst Haus cost. Start-up money to be provided by the organization. The brat cart must be staffed by at least 2 people (1 must be an adult). Pricing of the items is up to the organization. No charge for the use of the brat cart. Payment is due 15 days after invoice date.